The Conrad Macao Cotai Central hotel is a 5-star luxury hotel located in Macau, China. At present, it is the #1 rated hotel (out of 82) on TripAdvisor for Macau. The hotel touts itself as a multi-award winning destination hotel in Macau, perfect for discerning travelers. It has a range of amenities from fine dining to a spa to…in-room iPod docks! (Okay, that last one probably shouldn’t be listed as a prominent feature, but whatever.) Based on our excellent experience with the hotel, we can say that these proclamations are no exaggeration. It’s one of the nicest hotels at which we’ve stayed in the world. 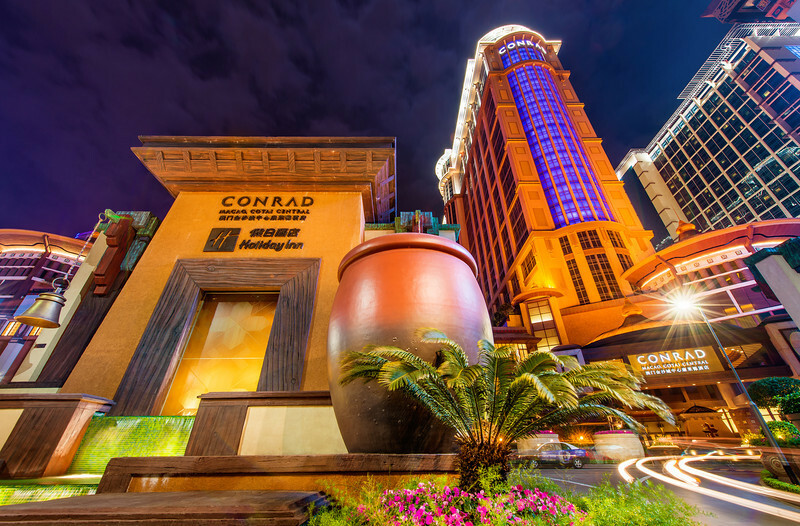 The Conrad is located in the area of Macau that is presently being extensively developed, it is not in “Downtown Macau.” This is significant because most of the things to do and see are located downtown, which is about a $20 taxi ride from the hotel. 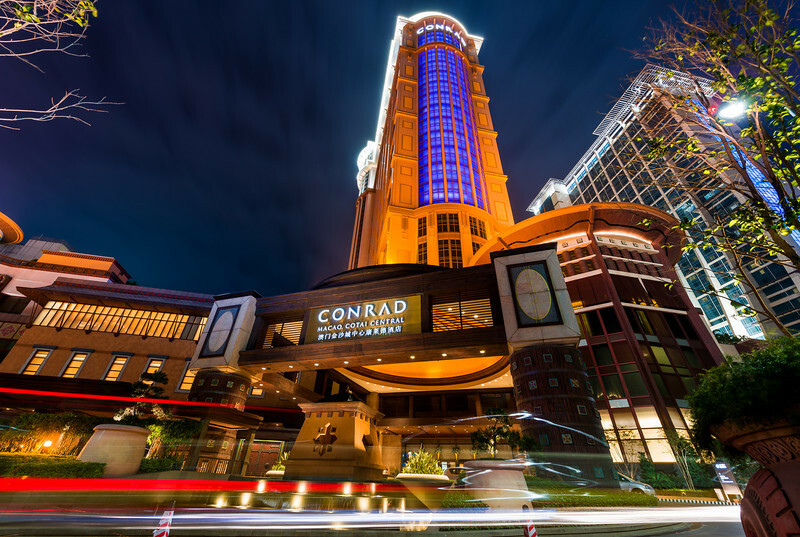 This is not to say there’s nothing near the Conrad–it’s right across the street from the Venetian Macao, which is also highly regarded, and near the Sands and in more or less the same complex as the Pacifica casino and Himalaya casino. The complex in which is located is called “Cotai Central,” which also houses a huge high-end mall, convention center, Sheraton, Holiday Inn, and probably a bunch of other stuff. If gambling is your sole priority in Macau, this is the perfect location. If you want to see the rich, Portuguese history, plan on having to spend some money on a taxi. Below is the view we had from our room–in the top left corner you can see the downtown Macau skyline. Based on the current rate of construction in the area, I suspect that by 2016 it will be just as ‘big’ as downtown. Also, while we didn’t stay in the Venetian Macao, we know the “Conrad Macau v. Venetian Macau” is a hot debate (we spent a lot of time researching it ourselves before making the decision! ), and based on what we’d saw, we’d highly recommend staying at the Conrad and playing at the Venetian. They’re literally 5 minutes apart, so walking between them is no major inconvenience. The Venetian was nice (we had a great dinner there), but it was a bit much, and didn’t seem like a true luxury hotel. The Conrad, on the other hand, was the pinnacle of luxury accommodations. With regard to service, the Conrad Macao provided–by far–the best service we have ever received at any hotel. A manager checked us into our room, and we mentioned to her that we wanted to do the UNESCO World Heritage Tour, and wanted to know if there were any other non-Casino locations we should visit. Within a couple of hours, we had a personalized itinerary delivered to our room along with the dessert pictured above. The main lobby and common areas of the Conrad Macao are gorgeous. It’s all very well-appointed with devolving into being ostentatious or garish, as (we felt) was the case with the Venetian Macao. The design is a modern take on classic Himalayan, and this is largely well-executed in the lobby and throughout the main areas. This style isn’t quite as apparent in the rooms, but they’re still incredibly nice. It was very large (we don’t have any baseline with other hotels in Macau, but it was larger than our room at the Grand Hyatt in Hong Kong) and looked brand new. Now, we know that the hotel is relatively new, but it looked brand new–as in like no one else had ever stayed there before! From the incredible bedding to the plush couch to the provided his and her slippers and bathrobes, the room was amazing. My only complaint about the room, and this is probably severe nitpicking, but it seemed a bit like “generic luxury.” One of the things we like about the Park Hyatt and boutique hotels at which we’ve stayed is that they blend luxury with little local touches to give the hotels character. Be it photography books from local artists, CDs, art, etc., the best hotels have touches of the local environment. The Conrad Macao had this to a degree in terms of general design downstairs, but we felt it could have gone a bit further in the rooms. This is in no way to diminish the quality and luxury of the experience, both of which are nearly unparalleled. Like I said, it’s severe nitpicking–overall the Conrad Macao was a better experience than all of those hotels with more character. The bathroom was large and well-appointed marble. It had two sinks, a bathtub, and a shower. I don’t have any photos of it, so you’ll just have to take my word for that. I was exhausted when we got to the hotel, and I guess I just completely blanked on photographing the bathroom. Odd, because I took 25+ photos of the main area. 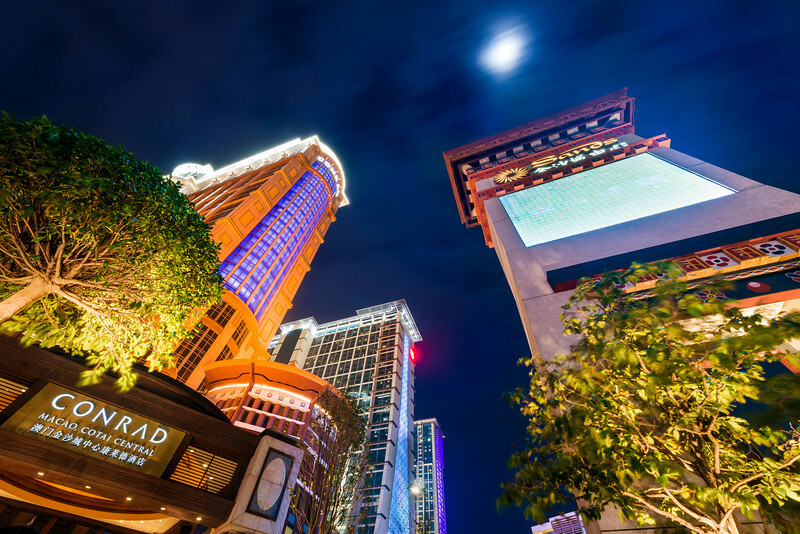 Overall, we would recommend the Conrad Macao in an instant to anyone traveling to Macao. Our room was just over $200/night, which put it lower than numerous other hotels we considered in Macau, and I can’t imagine those other hotels offering better accommodations for the price. While the Conrad Macao is a luxury hotel with beautiful accommodations, the star of the show here is the incredible service. How the staff manages to deliver such excellent, personalized service to each guest is quite mind-boggling to us, but they do. If service is important to you, you will be blown away by the Conrad Macau. Even if you have to take public transportation or a taxi to do things in downtown Macau, we still highly recommend staying here. Have you stayed at the Conrad Macao? If so, what did you think of it? If you haven’t stayed there, would you consider it as part of your trip to China? Please share your thoughts in the comments! Did you see any of the rooms at the Venetian in Macao? If so, what did you think of the two compared in terms of only rooms? Trying decide which to book today, thanks.